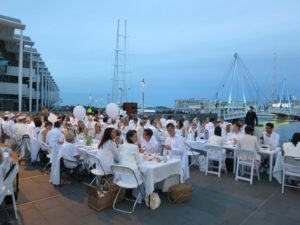 A few months back, I attended the fifth annual Diner en Blanc event here in Auckland. If you haven’t heard of Diner en Blanc, like I hadn’t six years ago, it involves taking along your own picnic hamper plus small, foldable table, white chairs, white tablecloth and white napkins and then having dinner with thousands of other glamorous strangers all dressed to the nines completely in white at a secret location. It. Is. So. Much. Fun. Let’s face it, in today’s world where we all worship at the altar of busyness and distractedness, when is the last time you have had good clean fun? I don’t mean finding happiness at the bottom of that glass of pinot or in the latest scroll or swipe, but in real life, in a backyard waterslide kind of way. You need fun like you need work and family. You have just forgotten how essential it is. Author, coach and personal development expert, Tony Robbins, has popularized the theory that we all have six human needs. These are needs, not wants. We crave these on a deep level. Two of our main needs are for certainty and for variety. We have a need for certainty—to feel safe and secure and to know that our expectations will be met. In apparent opposition to this, we have a need for variety—to have surprises and excitement in our lives (taking a vacation, for example). One of the best things about prioritizing fun is that it meets your deep needs for certainty and variety at the same time. Certainty: You get to plan and take action on enjoyable and exciting things you want to do. Variety: you get to do new things, expand your world and challenge yourself. You thought having fun was an extra, a ‘nice to have’ thing in your life and now you realize it is absolutely essential for meeting two of your primary needs. Many people simply say they don’t have time for fun. Oh yes, the time excuse. The old cliché of ‘work’ and ‘family’ taking priority. Let’s counter these jaded responses with some equally tired but oh so incredibly true sayings. You only live once. Life is not a dress rehearsal. The future is promised to no one. Look, we all have the same 24 hours in a day, and someone out there is swimming under a waterfall, learning how to juggle or indulging in a novel in front of a warm fire and you are not. You are busy being busy without adding value into your life. Our culture celebrates busyness! Don’t confuse this with living a fulfilling life. Adding fun back into our life allows us to say no to things that are really not that important – all the distractions and multi-tasking madness. It helps to clear pathways to what really lights us up and focus on doing things that makes us happy – isn’t that what we really all want? We are told that to really be fulfilled we must give to others. But to give graciously and without resentment, you also need to feel fulfilled yourself before you give. So fill yourself up first by prioritizing fun. Savor life’s pleasures, start a hobby or do something silly like dance by yourself to the most upbeat song on your playlist. Only after all that is it a good idea to give more than you do already. As speaker and author, Lisa Nichols, eloquently describes it, fill your cup up so that it is overflowing onto the saucer and only then “serve” from your saucer. Get fun back into your life and then not only will your joy bring happiness to others, but you will want to give back more to the world because you already feel so great. If having fun in itself is not enough of a pull, then remember these serious grounds to have fun – it meets our needs, gives us clarity and helps others. And to those people that argue that arranging to go to Diner en Blanc every year seems like hard work, I say, you are exactly right. It is because the event takes planning and organization that it is so much fun. As the thousands of guests put in so much effort just to get there, everyone is ready to cut loose and have a grand old time. I am not saying prioritizing fun is easy. It may take some hard work and organization to participate in even the smallest fun activity, but that only makes the experience richer and more fulfilling. Many of us crave something sweet and think we will find it in the back of the pantry or fridge. But this craving for something sweet is not a nutritional need, it is a deep need for more light and laughter in your life. So do something nice for yourself that doesn’t involve chocolate: prioritize fun and give yourself the chance to have some sweet and essential joy.